Usually, it’s the safe bet that nets you the smallest reward. But Valpak of Lexington is a sure bet that stands to net your small or mid-size business huge gains in patronage and customer loyalty. We’ve got the pedigree and track record to prove it. Contact Valpak of Lexington today to learn how we can put our direct mail marketing and digital advertising solutions to work for you. Knocking on every door in the greater Lexington area is one way to get the word out about your business, but it isn’t cost effective. Valpak and its Blue Envelope of coupons empowers you to take your print message to the neighborhoods most likely to respond to your brand’s products and services. Our shared mailing system saves you money on direct mail marketing, and it’s precise. Valpak of Lexington also provides digital marketing to expand your organization’s web presence through custom websites, a BPP (business profile page) on valpak.com and more. And about those hard numbers – Valpak’s custom performance tracking dashboard will empower your business to follow every ad dollar out the door and back. Our performance tracking tools monitor how consumers respond to your print ads, BPPs, digital coupons and more. Not ready to dive that deep? We also offer call tracking so you can monitor the calls coming into your business and how they’re being handled by your staff. Special advertising promotion: Mail to 10,000 homes for free when you buy 2 mailing areas. With Valpak, if a customer goes through you guys to get their granite and they need something, you have tracking… Valpak has been a tremendous asset to us. I love having it. It’s very convenient. For specific dates and coverage, contact your Valpak of Lexington representative. 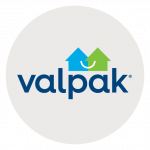 Valpak of Lexington is an independently owned Valpak franchise.